Oxidative [Au1]stress, through the production of oxygen metabolites such as hydrogen peroxide[Au2] (H2O2), increases vascular endothelial permeability and plays a crucial role in several lung diseases. The transient receptor potential (melastatin) 2 (TRPM2) is an oxidant-sensitive, nonselective cation channel that is widely expressed in mammalian tissues, including the vascular endothelium. We have demonstrated the involvement of TRPM2 in mediating oxidant-induced calcium entry and endothelial hyperpermeability in cultured pulmonary artery endothelial cells. Here, we provide evidence that neutrophil activation-dependent increase in endothelial permeability and neutrophil extravasation requires TRPM2 in cultured endothelial cells. In addition, protein kinase Cα (PKCα) that rapidly colocalizes with the short (nonconducting) TRPM2 isoform after exposure to hydrogen peroxide positively regulates calcium entry through the functional TRPM2 channel. 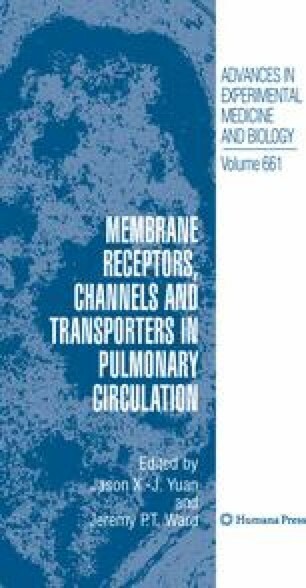 Thus, increase in lung microvessel permeability and neutrophil sequestration depends on the activation of endothelial TRPM2 by neutrophilic oxidants and on PKCα regulation of TRPM2 channel activity. Manipulating TRPM2 function in the endothelium may represent a novel strategy aimed to prevent oxidative stress-related vascular dysfunction.